Born Sada Koyama, Kawakami was Japan's first "actress". She was sent to train as a geisha at a young age, and acquired the -yakko when she became popular with patrons in 1887. Legend has it that around this time, Keio University student Momosuke Fukuzawa rescued her from a pack of wild dogs. Married in 1894 to Otojiro Kawakami of Oppekepe (a satirical verse) fame, Sadayakko Kawakami made her first appearance as Sadayakko-the-actress in a San Francisco performance by the Kawakami theatrical troupe, and went on to considerable acclaim throughout the country. She also appeared at the World Exposition in Paris and received a prestigious award from the French government, going on to become known as Madame Sadayakko. Following the death of Otojiro, Kawakami retired from acting after completing her mourning on the sixth anniversary of her husband's passing. She set up Kawakami Silk (Kawakami Kenpu) Co., Ltd. a purveyor of the finest silks for export in Ozone, Nagoya. Residing in Nagoya, she lived with her old acquaintance Momosuke as her business partner. Momosuke subsequently returned to Tokyo and Kawakami followed suit, but she spent traipsing back and forth between the capital and Nagoya. Then, using her own fortune to establish Teishoji Temple (literally "the temple of Sada shining") in Unuma, Gifu Prefecture in 1933, Kawakami split her time between Tokyo and Unuma. She died in 1946 at her retreat in Atami, and was interred at Teishoji Temple. Known in the Taisho Period as the "king of electric power", he established numerous power stations on the Kiso River system. A formidable intellect from his early years, the prodigy he entered prestigious Keio-gijuku (Keio University), where his outstanding results earned him the attention of the mighty Fukuzawa family. He married Yukichi Fukuzawa's second daughter Fusa, and took the Fukuzawa family name. Momosuke went to study in the USA in 1887. Upon his return, he took a job at a Hokkaido coal mine railway company, but resigned his position when he contracted pulmonary tuberculosis. Hospitalized, Momosuke's life at this time was dedicated to convalescence. 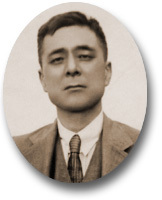 The outbreak of the Japan-Russia war saw Momosuke earn a fortune in shares, and so began his life as a businessman. Appointed director of Nagoya Electricity (Nagoya Dento) Co., Ltd. in 1913, Momosuke merged electric power companies to form Daido Electric Power, Co., Ltd. As president, Momosuke set about an ambitious electric power development project along the Kisogawa River system based in Nagoya. At the so-called Futaba Palace in Nagoya, he and Sadayakko Kawakami combined to hobnob with the bigwigs of the political and financial communities in order to further his electric power interests. After achieving feats such as constructing seven power stations on the Kiso River—including Oi electric power plant, Japan's first power station to use a dam—Momosuke took a back seat in 1926 to let his successors take over once he had got the business on track, choosing to return to Tokyo and lead a reclusive life. 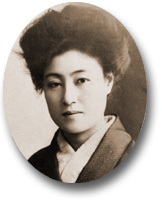 Momosuke died at home in Shibuya, Tokyo in 1928. A Momosuke Fukuzawa memorial facility is located in Nagiso in Nagano Prefecture.